When a food dilemma arises, I can count on Ara Kassabian to come to my rescue. When I lamented about having to forego some of my favorite recipes which contain white flour and white sugar – such as paklava, I asked readers if anyone knew if there’s such a thing as whole wheat phyllo dough. I even contacted the Athens company, but unfortunately they don't make a whole wheat version of it. Ara responded quickly by sharing a link for a recipe called baklavash which uses lavash in place of phyllo dough for traditional ‘baklava’ (aka 'paklava' to Armenians). With so many brands of whole wheat lavash on the market, this would be a cinch to make! 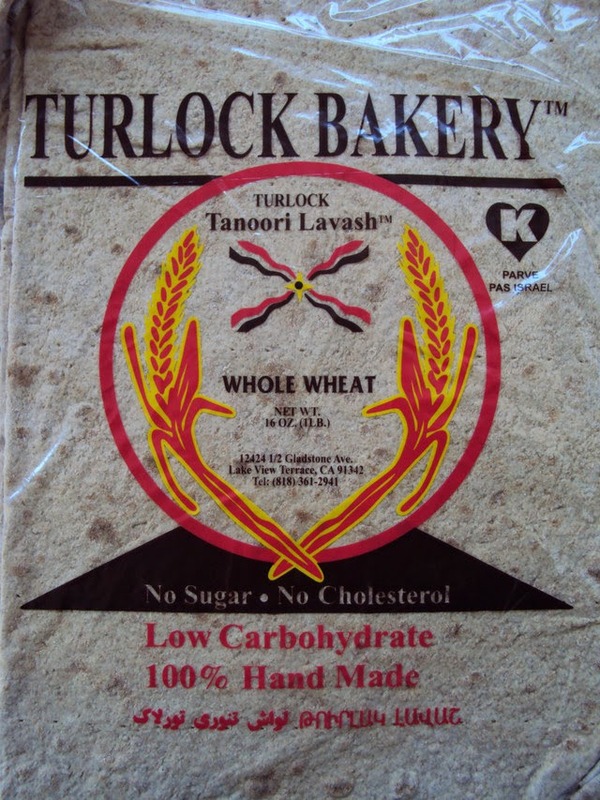 I purchased the Turlock Bakery lavash locally, and just learned that our brand new Trader Joe's carries whole wheat lavash, too. What a discovery!! Finding a suitable substitute for the white sugar, however, will be quite another story. NOTE: The 'paklavash' recipe has not yet been tested in The Armenian Kitchen, but once that’s done, I’ll share our evaluation and photo. 2. In a bowl, combine the ground nuts and ground cinnamon. Set aside. 3. Measure the pan you plan to use for baking and cut the sheets of lavash to fit the inside dimensions of the pan. NOTE: Using a fork, prick each lavash sheet. This will allow the butter and syrup to seep through to prevent the paklavash from becoming dry. 4. Brush melted butter on the bottom of a 9”x13”pan. Place one sheet of lavash which has been cut to fit the pan on the bottom of the pan. Brush generously with melted butter. Sprinkle a layer of the nut mixture. NOTE: Make sure you generously butter each layer of lavash. 5. Brush the next sheet of lavash with butter, placing the buttered-side down on top of the nut layer. Brush more butter on the top of that sheet, and sprinkle more of the nut mixture on top. Continue the process until all of the nut filling and lavash pieces are used. You should end up with a sheet of buttered lavash as the top layer. 7. Bake the paklavash for 30-35 minutes at 350°F until lightly golden. In a saucepan, bring 2 cups water and 1 cup granulated sugar to a boil. Reduce heat and simmer about 5 minutes. Stir in lemon juice. Remove from heat and allow to cool. 9. Remove the paklavash from the oven; drizzle with the cooled syrup. Allow to sit for at least 2 hours before serving. Hmmm, what about agave nectar instead of sugar?